2) Emotionally, anxiety portrays a secondary emotion in response to a primary emotional reaction. All this sophisticated state of mind is strictly regulated by a number of hormones and peptides which, operating on the NSC on its limbic and cortical areas, deal whit our mood and compromise our response to stress stimuli. A little review about the main neurotransmitters of the stress pathways will be illustrated in this essay. 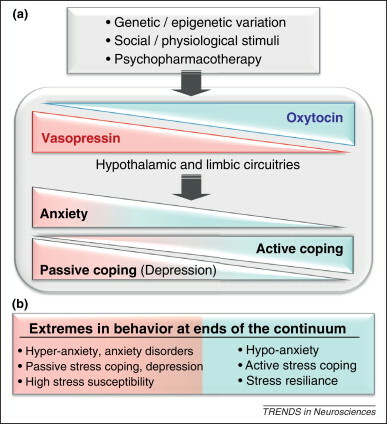 Oxytocin and vasopressin are regulators of anxiety, stress-coping, and sociality: these are released within hypothalamic and limbic areas from dendrites, axons and perikarya independently of, or coordinated with, secretion from neurohypophysial terminals. 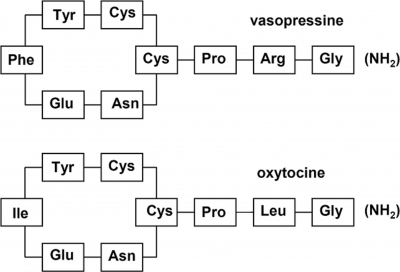 Central oxytocin exerts anxiolytic and antidepressive effects, whereas vasopressin tends to show anxiogenic and depressive actions. Evidence from pharmacological and genetic association studies confirms their involvement in individual variation of emotional traits extending to psychopathology. The opposite effects of this two hormones are strictly connected whit the emotional behavior of the subject, acting as an active neuropeptide system in equilibrium. Shifting the balance between the neuropeptide systems towards oxytocin, by positive social stimuli, may help to improve emotional behaviors and reinstate mental health. A dynamic interplay of genetic, epigenetic, and environmental factors orchestrates both individual behavioral variations and the etiology of anxiety related disorders. The synthesis and release of OXT and AVP within the brain are driven by anxiogenic, stressful, and notably social (both positive and negative) stimuli. Once released, both neuropeptides are key regulators of anxiety-related or depression-like behavior, and multiple aspects of social behavior. Following their neuronal synthesis in the hypothalamic supraoptic (SON) and paraventricular (PVN) nuclei (OXT and AVP), or in regions of the limbic system (AVP), both neuropeptides are centrally released to regulate neuronal processes. As neurotransmitters, following release from axon terminals, they contribute to the synaptic mode of rapid information processing via neuronal connections. A complementary mode of releasing is a parachrinal way. Upon diffusion to nearby or remote receptors via the extracellular fluid and ligand binding, the association of the OXT receptor (OXTR) and the AVP receptor (AVPR) subtypes AVPR1A and AVPR1B with specific intraneuronal signaling cascades determines their acute or long-term effects. Whereas the quality of neuropeptide-induced effects is primarily determined by localization of their receptors in distinct, particularly hypothalamic and limbic, brain areas, local concentration of the neuropeptide ligand in the ECF and receptor density are the major determinants of the intensity and duration of their actions. Importantly, OXT and AVP actions may partly overlap, due to a large homology between their receptors, and this has both physiological and pharmacological implications. Experiments have confirmed that the releasing of these hormones is stimulus-dependent, both central and peripheral. OXT exerts anxiolytic effects and modulates neuronal functions related to physiological stress responses, mainly at the levels of the PVN and amygdala. Particularly intriguing is the reduction in emotional responsiveness during periods of high activity of the endogenous OXT system, such as during lactation and sexual activity. AVP brain system mediates anxiogenic effects instead, as shown by a variety of gain- and loss-of-function studies on AVPR and its AVPR1A and AVPR1B subtypes. A lot of rats based experiments have shown that a Low AVP Levels rats (LAL) and High AVP Levels rats (HAL) represent the exstremes of the anxiety spectrum, candidating the AVP gene as the inborn anxiety gene. Concerning social anxiety, the AVPR1A of the mouse medial amygdala was suggested to mediate prosocial behaviors, with an opposite, antisocial role for AVPR1B. *However, there is also general support for an anxiolytic effect of OXT in humans. For example, nursing mothers with higher OXT levels are more likely to describe positive mood states and reduced anxiety. By contrast, women who were abused in childhood have lower OXT concentrations in CSF and higher anxiety scores. In a lot of human studies, intranasal administration of synthetic OXT is currently used to increase the availability of OXT in the brain ECF and, consequently, brain OXT system activity. Despite individual variations in OXT effectiveness , these studies support the capacity of the neuropeptide to modulate anxiety circuitries, including reduced and enhanced amygdala reactivity to fearful faces. Moreover, in patients suffering from social anxiety disorder or autism, intranasal OXT reduced several symptoms of the disease. Supporting rodent studies, emotional effects of synthet-ic AVP in humans also include increased anxiety and fear responses. For example behavioral responses to threatening faces were elevated upon intra-nasal AVP. Further, amygdala responses to similar socio-emotional stimulation were found to be associated with genetic variations of AVPR1A and AVPR1B antagonists were shown to attenuate indices of anxiety and depression in animal models and depressed individuals. The mechanisms underlying anxiolytic and antidepressive effects of OXT include many interactions with monoaminergic systems, in particular the serotonergic, and corticotropin-releasing factor (CRF) systems, both of which have been implicated in anxiety disorders and depression. A subpopulation of OXTR-expressing serotonergic neurons exists within the raphe nucleus, and in addiction, stimulation of serotonin release activates hypothalamic OXT neurons. OXT-based therapy might be an additional option to reverse the deficits in serotonergic neurotransmission in depressed individuals, specially because some effects of selective serotonin reuptake inhibitors (SSRI) are thought to be mediated by OXT. In addition to AVP, hyperactivity of the brain CRF system has been linked to stress-related disorders such as depression. In support, CRF and CRFR1 (CRF receptor 1) genes are overexpressed in depressed patients. 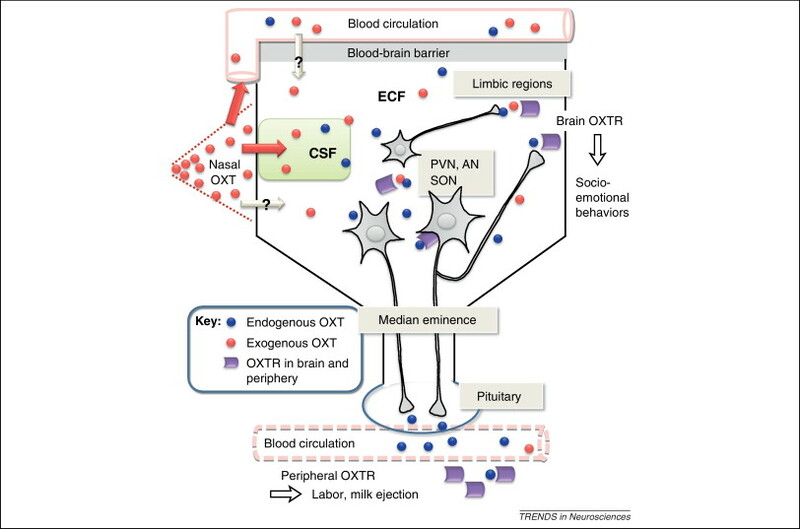 OXT actions may partly be mediated via effects on hypothalamic CRF neurons , which express OXTR. Positive stimuli and negative experiences both influence the balance OXT/AVP. This is reflected by alterations in the expression, release, and receptor binding of OXT/AVP within limbic regions and, partly, in plasma OXT or AVP concentrations. Rodent and human studies suggest that reinforcing positive social interactions is generally beneficial for mental health, improves emotional stability, protects against psychopathologies. On the other hand, interrupted or lack of social interactions have been associated with increased anxiety or depression-like behavior. While OXT and AVP act a main and more known role in the regulation of anxiety and other social behaviors, there are many other peptides which are also involved in this emotional response. Their action is not perfectly clear yet, but studies performed on animals have helped figuring out how they work on the human brain too. Here will be defined the effects of four more peptides (UCNS, CRF, CCK and NPY), particularly concentrated in the limbic system, whose actions are partially interconnected. It is widely accepted that stress, anxiety and depression are in large part controlled by corticotropin-releasing factor (CRF) and its receptors. CRF is produced by parvocellular neuroendocrine cells within the paraventricular nucleus of the hypothalamus and is released at the median eminence from neurosecretory terminals of these neurons into the primary capillary plexus of the hypothalamo-hypophyseal portal system. The portal system carries the CRF to the anterior lobe of the pituitary, where it stimulates corticotropic cells to secrete adrenocorticotropic hormone (ACTH) and other biologically-active substances, like β- endorphin. β- endorphin is classified as an endogenous opioid peptide neurotransmitter resulting from the same gene of ACTH (POMC gene, which represents their precursor), and it seems to mediate the essential brain sedation to overcome a stressful situation. This system is critical for the neuroendocrine and behavioral responses to stressful situations (such as anxiety and depression) in vertebrates. Nevertheless, some of the actions on CRF receptors (CRFR) are mediated not by CRF, but by a family of related Urocortin peptides : Ucn1, Ucn2 and Ucn3. CRF and the individual Ucns act in a complementary and brain region-specific manner to regulate anxiety-related behaviors. CRF receptors are distributed differently throughout the brain: while CRFR1 is widely expressed, CRFR2 is expressed in a more discrete but partially overlapping manner: the selective expression of CRFR2 is observed in anxiety and depression-related brain nuclei, including the medial amygdala, bed nucleus of stria terminalis, lateral septum and the dorsal raphe nucleus. UCN1 is primarily expressed in the centrally-projecting Edinger-Westphal nucleus (Ewcp), called non-preganglionic Edinger-Westphal nucleus (distinguished from the preganglionic Edinger-Westphal nucleus), and in the lateral superior olive and supraoptic nucleus. UCN2 is expressed in the PVN, supraoptic nucleus, arcuate nucleus, locus coeruleus, the trigeminal, facial and hypoglossal motor nuclei and the meninges. UCN3 is expressed in medial preoptic area, perifornical area, BNST, MeA, ventral premammillary nucleus, superior olivary nucleus and parabrachial nucleus. While both CRFR1-KOs and CRF-KOs showed hypothalamic-pituitary-adrenal deficits, deletion of CRFR1, but not CRF, lead to attenuation of anxiety-like behaviors. This evidence suggested that other CRFR ligands (such as the Ucns) play important roles in the behavioral responses to stressors, related to adaptation and maladaptation to stress, such as anxiety and depression (moreover, even in alcohol consumption). While CRFR1-KO mice clearly showed decreased measures of anxiety and stress, CRFR2-KOs tended to show heightened anxiety. Therefore, it was suggested that CRF-CRFR1 system is essential for initiating stress responses, whereas Ucns-CRFR2 system is involved in terminating the stress response. Cholecystokinin system seems to exert a potential role in panic and anxiety disorder. It was originally isolated in the gastrointestinal system, but it was found throughout the nervous system too as a neurotransmitter synthesized by neurons, with particularly high concentrations distributed in the entire limbic system. There are two CCK receptors: CCK- A and CCK-B. Their designations refer to their primary localization (“A” for alimentary and “B” for brain) although they both seem to be expressed evenly in these two parts of the body. Both receptors belong to the family of G-protein coupled receptors. This peptide seems to increase anxiety-like behavior: the most striking tests showed that intravenous injection of CCK could even cause panic attacks in healthy subjects. Regional cerebral blood flow underwent changes in anterior cingulate gyrus, the claustrum-insular- amygdala region, and cerebellar vermis. It's worthy to focus on the fact that patients with panic disorder were more sensitive to the panicogenic effect of CCK compared to healthy controls. So the threshold for panic attack may be lower in those with panic disorder. Moreover, CCK probably acts in concordance with the endogenous cannabinoid system in the modulation of fear inhibition and extinction on the amygdala. Neuropeptide Y may play a very interesting role in counteracting stress effects, enhancing their extinction. Initially discovered as part of the pancreatic polypeptide family, throughout the brain NPY is notably distributed in the cortical, limbic and hypothalamic regions, especially in the amygdala, where it is mostly synthesized. NPY is also found to target the paraventricular nucleus, where it stimulates synthesis of CRF and induces hypothalamic-pituitary-adrenal axis stress responses, involved in initiating stress responses. There are six known NPY receptors designated Y1 through Y6, and their effects are mediated by G-protein-coupled downstream signaling. Intracerebro-ventricular or intra-amygdala infusion of NPY leads to an anxiolytic behavioral profile in several animal models. In fact, an overexpression of NPY in the amygdala attenuated behavioral responses to stress and reduced anxiety-like behavior. The anxiolytic behavioral effects of NPY seems to be mediated primarily through the Y1 receptor.